Hiring an attorney normally takes place after you have a personal interview or phone conference with the lawyer. The attorney you hire could very well have your freedom in his or her hands. It is imperative that you hire someone you trust, and who is competent to handle your legal problem. An attorney that is Board Certified is going to charge more than someone fresh out of law school. You typically get what you pay for. What is your freedom worth? On your first telephone call to the office, you will speak to a staff member regarding specific information about the charge(s) against you. With the information you provide, we confirm with the court the status of your case. In addition, we research the matter with the court to obtain any additional data regarding your case of which you may not be aware. Prospective cases are reviewed on an individual basis. James determines the appropriate attorney fees based on your specific charges. A staff member will contact you regarding the attorney fees. The initial consultation is free. 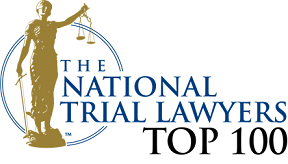 We understand that you must have total confidence and trust in your attorney. We encourage you to make an appointment to meet with James and meet the staff. Bring all papers and documents about the charges or your case. This may be a chaotic time in your life, and it is beneficial to list your questions. Bring them with you to the initial consultation, as we want to answer all of your questions. James will review the information from the courts with you, listen to your description of the incident and advise you what can be done to provide you with the best possible defense and the possible outcome. The attorney fees quoted will be the total attorney fees for the case. After having all of your questions answered by James, you will visit with Lynda Kay Makin, the Legal Administrator, about the financial arrangements. We accept MasterCard, Visa, Discover, cash, check, money order or wire transfers. If you are unable to pay the attorney fees in full, payment arrangements can usually be made at that time. The Law Office of James R. Makin, P.C. 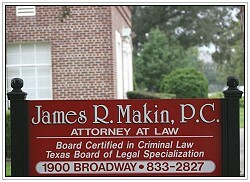 © Copyright 2006-2009, The Law Office of James R. Makin, P.C., all rights reserved. James R. Makin is a member of the, Greater Beaumont Chamber of Commerce, and an Accredited Member of The Better Business Bureau.